I am so happy...it's December 1st, and that means it's my favorite day of the month...release day at Doodle Pantry. I did something a little bit different this time around. After I write the instructions on how the card was made, I will also write directions on how I created the wreath. It was really easy to do. Here is my sample for you. For this card, I used the newly released Christmas Cactus set. The designer paper was printed on white card stock. The sentiment was also printed on white card stock and then I used a 1 1/4" circle punch to cut it out. I used real red ink from Stampin' Up! to distress the circle. After the wreath was made (see instructions below), I pulled it into my Silhouette Cameo and did an outside trace. I then did an outside offset on the trace so that I would have a mat behind the image. The mat was cut with real red card stock. I cut the designer paper at 5 1/4' x 5 1/4" and layered it onto a piece of real red card stock which is 5 3/8" x 5 3/8". The card base is 5 1/2" x 5 1/2" white card stock. The wreath image was taped to the mat and then I popped it up slightly with foam dots. I then popped up the sentiment into the center with thin foam dots. There is a little stem on the end of each of the flowers and I glued oval clear crystals onto each one. I added red crystals into the center of each flower bunch. I also added clear crystal swirls in each corner and finished the card off with a white satin double bow with gold bells hanging from the middle. Here is a picture of what you get in the set. How I made the wreath: I used the red and green pre-printed cactus flower (without shading in the center) to create the wreath. You can use any imaging software that has rotating capabilities. That was the only thing that was done to the original flower. I used Adobe Fireworks to make my .png file. Here's what I did. I started by creating a 1" circle (you use this to place the flowers properly, but you will delete it at the end). I then opened the flower and sized it to 1 inch. I copied the flower four times and using the rotating tool, I placed the tip of each flower on the top, bottom, left and right center edges. I did a horizontal alignment on the left and right flower and a vertical alignment on the top and bottom flowers. I then selected all four flowers. 1. Copy the four selected flowers. 2. Before pasting, you need to de-select the four flowers. 3. Paste (the four flowers you just pasted will now be selected). Remember when you paste, it will paste the new images directly on top of the old images. 4. Click on rotate tool. 5. Holding the shift key (gives you precise movement), hover mouse over right corner of image and click and hold. 6. Rotate down one movement. You keep following those same steps 4 more times, for a total of 24 flowers in a circle. I hope I didn't make this sound difficult, because it's really easy. There is a SALE going on for the next 2 days at Doodle Pantry. The prices are already marked down, so you don't need a code at checkout. Also, don't forget to stop by Doodle Pantry's blog and join us for our monthly challenge. There is no free set this month, but 2 lucky people will win gift certificates to the store. Any digital image may be used. You have until December 22nd to enter and winners will be announced on December 24th. Fantastic idea ! It turned out so beautiful. Love the bells too. I agree Susan this is stunning. Love everything about this card. That bow and bell are a perfect finish. PS So glad you shared it with us at Just us Girls this week. Hi Susan, wow girl! This is just amazing! I am so glad you did instructions. This is just beautiful! Great creativity! Wow! This is amazing! Thanks for the tutorial on how you created that wreath! Thanks for joining us this week at Just Us Girls! Your card is just gorgeous! It was so kind of you to explain your process to make the wreath! It's very beautiful, I also like the flourish's. Thank you for sharing your creativity with us at Word Art Wednesday today. We appreciate your faithfulness. 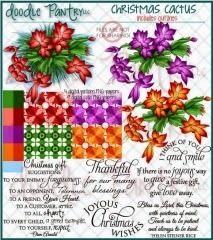 Beautifully created and love the beautiful colors you used for your Christmas greeting. Lovely card. Thanks for joining us at Christmas Card Challenges. Thank you so much for joining us this week for our Word Art Wednesday challenge. We are delighted you decided to play along and share this fantastic creation. Lovely card! Thanks so much for playing along with the Simon Says Stamp Wednesday Challenge! Lovely card great idea! Love the sentiment! Thank you for joining Quirky Crafts! So stunning! I love the added gold bells too!